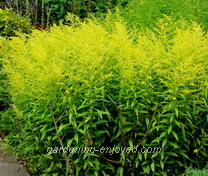 Dallying In The Dirt, Issue #139 ---Solidago is a wonderful fall perennial. We are still trying to get caught up with all of the chores that accumulated while we were in Quebec and that’s why “Dallying” didn’t make it out until Sunday this week. Dating it as the first of September somehow changes this gardener’s perspective. Whatever projects I was going to do this summer, are now either completed or aren’t going to be. We did get a lot accomplished this summer and need to take the time to enjoy and appreciate the results of our efforts. Many of the bare spots in our creeping Thyme groundcover paths have been filled in and the tedious work of weeding them will be greatly reduced. Not many weeds can penetrate a healthy mat of Thyme. The mulch has been spread on most of the front and that will be finished in the next week or so. Those perennial beds are changing dramatically again as autumn is approaching. That constant, almost daily, change is what makes these beds so interesting and worth the effort and regular visits. The many tall Sedums are starting to display their varying shades of red and pink. Some have coloured foliage as well. The most noticed plant in my fall garden is often derided as a weed and a allergen. It’s neither. Solidago canadensis, the common Goldenrod provides a wonderful blast of bright yellow throughout the fall and it does not have a wind borne pollen that could be an allergen. It gets wrongly accused because it is so obvious when the ragweed growing beside it and disseminating tons of pollen is green and inconspicuous. There are many wonderful times to look forward to in the autumn garden. It is not just a time to think about putting the garden to bed. The seeded Kohl Rabi and Pak Choi need to be thinned so that they can develop into large tasty delights over the next few weeks. September is the proper time to establish new turf areas if you really must have one. I admit to a small turf area for the visiting grandchildren and dogs to use. The grandchildren have much more fun running and hiding through the maze of paths. Deciduous trees and shrubs are very successfully planted as autumn progresses. As soon as their leaves show any sign of fading or turning colour they can be dug up and move with great success. Their roots will continue to grow and establish long after the leaves have disappeared. 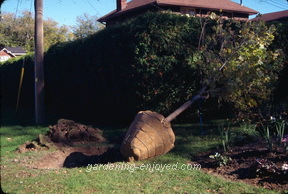 The best part is that most garden centres will start to have sales and discounts in the fall so that you can plant that new tree at the best time of year and save money doing it. One of the many reasons that I have trouble getting caught up with all of the chores on my own garden is being “forced” to take a day away and attend one of the great perks of being a garden writer. Stokes Seeds in partnership with Loblaws has a tasting day. They are trialing new varieties of vegetables that Stokes might put in their catalogue and that Loblaws might offer in their retail garden centres. A dedicated group of garden writers wanders though the trial grounds tasting a variety of Tomatoes and Peppers and assorted other things. Around a lunch table we compare notes and offer our opinions. 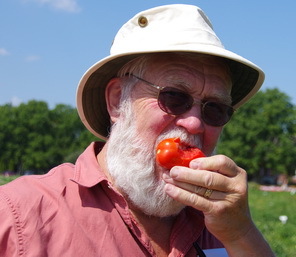 It really is amazing how many different opinions one Tomato can create and how we all struggle to find the appropriate words to describe the taste and texture of such a well known vegetable. After lunch this year we adjourned to the Vineland research station where they are doing many exciting things. To help us with that tasting dilemma they have developed a sensory lab where they are creating a vocabulary to accurately and consistently describe those tastes and textures. Rasheed Asks? I plan to use the existing black soil and regular garden area's for Garilc harvest. Appreciate if you share your expertise and other idea's for fall preparation. Ken Answers! Garlic is not a very fussy plant. Any reasonable garden soil, possibly amended with some compost or other organic matter, will suffice. Just give the plants a little room. They do not do well if they have to compete for space with other plants. Mary Asks? I have several perennials that seem to have a grey mildew? , phlox is one. I have removed these dead parts, and discarded in the brown bags. This has happened during our recent dry spell, the affected plants are not necessarily beside each other! Ken Answers! Powdery mildew is a common disease as fall approaches and it attacks a variety of plant such as Phlox and my Tuberous Begonias. It is unsightly but does little lasting damage. Discarding affected parts in the municipal compost, instead of your own, will help control it but it will blow in from somewhere. There are sprays that will slow it but the time and cost are usually not worth it as it appears near the end of the season. Susann Asks? my Lily's of the Valley are brown and lying on the ground, can I mow over what's left of them ? Have you heard of "Nincompoop" mulch? I not a big mulch fan because putting wood chips on dirt doesn't seem right to me but a few years ago I started using nincompoop after seeing the ad in Making a Garden magazine and I love it!! It is made from sterilized manure (so organic) looks like dirt, repels slugs and snails, it really stops weeds and retains moisture. you do have to keep replacing it but it amends the soil ... talk about multi-tasking! Home Hardware sells it in 56 litre bags for $8.99. Ken Answers! Go ahead and mow your Lily of the valley. It's so persistent that you could probably mow it mid summer and it would come back. I don't like wood chips either and that's my mulch dilemma. I've had a bag of Nincompoop laying around for a couple of years and finally used it on a new batch of Iris about a month ago. Seemed to be a little crusty looking when it got dry but still evaluating. It's cost is prohibitive when you have to redo it every year on as many beds as I try to maintain.